Discussion in 'Amp Central Station' started by bradpdx, Mar 3, 2015. I recently bought a '68 Custom Princeton Reverb, having been charmed at the store. It has not disappointed, and is a delightfully full sounding amp with amazing breakup. Even at acoustic volume levels, it sounds lush. Having a few minutes while waiting for a phone call, I thought I'd plot out the differences in the tone circuits between the standard '65 tone stack and the '68 Custom. The change is very simple, and you may easily convert one to the other. The '65 is in red, the '68 Custom in green. 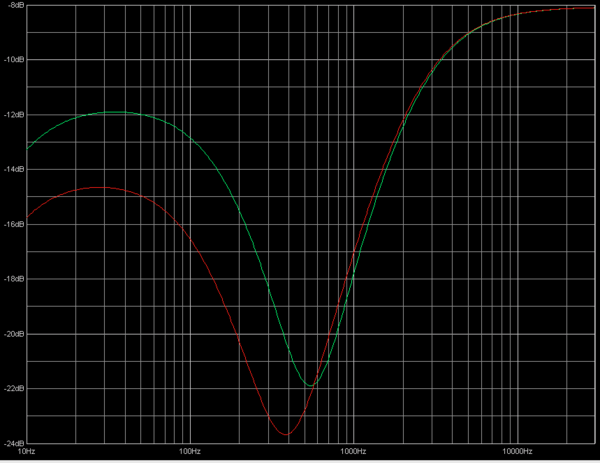 For clarity, this plot is run with the Bass at 3 and the Treble at 7, a common setting. I used the infamous Duncan ToneStack Generator, an ancient Windows app, running in Crossover emulation on a MacBook Pro. Bear in mind that the low E string is at 80Hz, unless you are Jim Campilongo. In the critical area for midrange warmth (200Hz - 400Hz) the '68 Custom has about 5dB more gain. That's mainly what people are hearing. Yes, the '68 Custom has more bass. Or more accurately, the Bass control doesn't go down as far - it stops at what would be approximately 2 on the stock circuit. Well, that was fun. Now I gotta answer the phone. Yeah it seemed from looking at the schematics that you could get there by just turning up the bass control if you had a PRRI. W/O considering the NFB difference. Does a PR need more bass? It's not the same. The '68 moves the midrange dip up higher in frequency, and smaller in cut. The two circuits differ in a very critical area of response in lower mids, and you can't change that with the Bass control alone. It's mainly the use of a 0.022mfd cap instead of a 0.047mfd in the mid cut circuit. It's a bit of a hybrid between the Marshall tone stack and the old Fender. Is there a schematic of the '68 Custom (or at least a list of changes from a stock PR) available? As you can see, the tone circuit is modified with a .022mfd mid scoop cap instead of .047mfd, while the 18k resistor in series with the Bass control reduces the amount of bass cut when the pot is below 3 or so. It does have a potent low end, but the Celestion 10" stays tight. I do not understand the Jim Campilongo "bass on 10" thing at all, but this oughta do it. I'll just add that if you want the Bass control to behave more like the '65 Princeton (and all regular Princetons) just short out the 18K resistor. It will still have more lower mids than a regular Fender, which is kinda nice. Interesting, I may give this a try this weekend. For those who can't get to the calculator, could a blue line be added for say, '65, Bass at 5 and treble at 7? Orange line for Bass at 5, Treble at 6? Very informative already. Thanks for posting. I bought a PRRI that has too much treble. Run it at bass on 10 and treble on 0. Have tried a Gold 10 and now a V30. Both good speakers but still too trebly. Would like to mod the circuit but not convinced there would be enough of a change. Sounds like the wrong amp for you. You must prefer a very dark sound, in which case Fenders may not be the way to go. I run treble around 7-8, bass 2 for most Tele work on my CPR. I also like dark sounds and the 68 is the modt inspiring to play Fender amp I've ever plugged into. I know this thread goes back a ways. Hopefully some of you with experience with it are still hanging about. I have the 68 reissue version of the Princeton. I've since lost a lot of my vision but I changed the transformers and converted to 6L6's. It is still too dark for my tastes. Bass is all the way off, treble all the way up. OK with single coils but not with humbuckers. I play clean a fair amount. I'm considering doing the Fromel mod but, although it uses higher quality components and they maintain increases clarity and headroom, especially with what they do in the rectifier circuit, I am concerned I will still have the darkness. Is the idea of changing C24 to a smaller value still something recommended? They will do what I request. Thanks. Its super easy and exactly what youre looking for. Well I suppose "thin" is kind of accurate since it does get rid of that persistent bottom end. I didn't like the amp until I shorted that resistor because I couldn't dial the bass down enough. After the mod, I love my 68 PR. White or yellow and blue would have been better colors for us colorblind guys. I'm red/green colorblind, they look pretty much identical to me.